Sir Billy Connolly has said sorry for "depressing" fans after describing his life as "slipping away". The Glasgow-born comedian made the comments during a BBC documentary about his life with Parkinson's disease. However, his wife Pamela Stephenson posted a video on her Twitter account showing Sir Billy playing a banjo and saying: "Not dying, not dead, not slipping away". Sir Billy was diagnosed with Parkinson's disease in 2013. The two-part documentary series, which aired on BBC Two and was watched by 2.2 million viewers, showed him reflecting on his life and career in showbiz. During Billy Connolly: Made In Scotland, he said: "My life, it's slipping away and I can feel it and I should. "I'm 75, I'm near the end. I'm a damn sight nearer the end than I am the beginning. But it doesn't frighten me, it's an adventure and it is quite interesting to see myself slipping away." 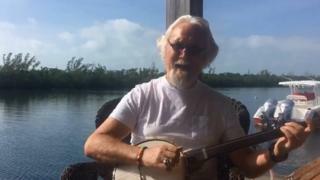 However, in the Twitter posting, Sir Billy can be seen sitting playing the banjo under a blue sky and is heard saying: "Sorry if I depressed you. Maybe I should have phrased it better."